I am so excited that THE GERRY BROOKS is about to release his very first book. If you have never seen Mr. Brooks’ videos on Youtube then you are really missing out. Whether he’s dressed like a flamingo or complaining about not being able to open his sweet & sour sauce…the guy is HILARIOUS! 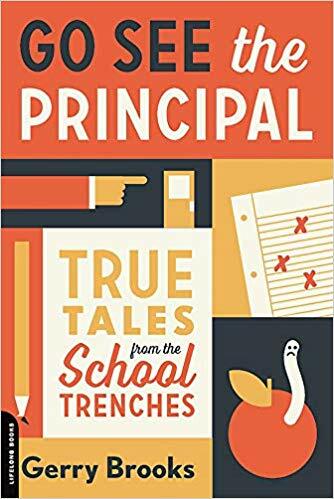 Gerry Brooks is an elementary school principal turned YouTube celebrity who entertains K-12 teachers, administrators, and parents across the country. He tells jokes with the kind of mocking humor that gets a laugh, yet can be safely shared in school. After all, even great schools have bad days — when lesson plans fall through, disgruntled parents complain, kids throw temper tantrums because they have to use the same spoon for their applesauce and mashed potatoes, and of course, dealing with…The Horror! The Horror!…dreaded assessments. Ranging from practical topics like social media use in the class­room and parent-teacher conferences to more lighthearted sections such as “Pickup and Dropoff: An Exercise in Humanity” and “School Supplies: Yes, We Really Need All That Stuff,” Go See the Principal offers comic relief, inspiration, and advice to those who need it the most. You can pre-order your copy today (31% off). I can’t wait to get my copy! Check it out on Amazon.